Benedict Cumberbatch and Martin Freeman are headed to the altar! Exclusive Sherlock Holmes and Dr. Watson mini-figures. Inspired by the BBC TV series Sherlock episode "The Sign of Three." Unique Union Jack packaging with a removable 221B Baker Street backdrop! Available only at Entertainment Earth! Entertainment Earth Exclusive! Watson is getting married! "Consulting detective" Sherlock Holmes hopes to give the perfect best-man speech at the wedding of his trusty companion, Dr. John Watson, but murder may be afoot! Based on the popular BBC series Sherlock starring Benedict Cumberbatch and Martin Freeman, these 3-inch tall mini-figures capture the duo dressed in their finest, as seen in the Season 3 episode "The Sign of Three." 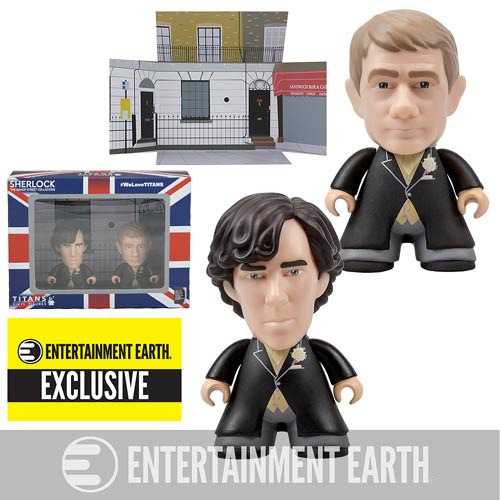 This limited edition Sherlock Titans Sherlock and John Wedding Suit 3-Inch Vinyl Mini-Figures EE Exclusive comes in special Union Jack window-box packaging with a backdrop of famous 221B Baker Street inside that can be removed to create a diorama. And you can't buy this 2-pack anywhere except Entertainment Earth! Ages 15 and up.